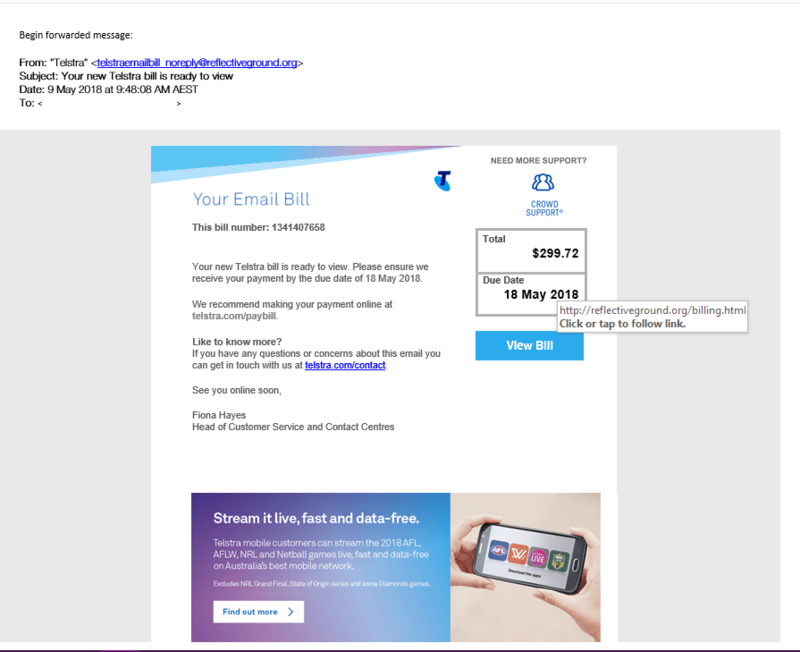 Warning to Telstra customers – there is a new Telstra phone bill email scam to watch out for! Do you receive your Telstra bills by email? This is definitely one to watch out for. We received the first of these emails on the 9th May – and boy do they look convincing! So convincing in fact, that my Father in Law thought it was a legitimate bill and clicked on the ‘View Bill’ button. Then forwarded me the entire email because it didn’t work for him and he couldn’t work out how to pay the bill! Probably lucky for him that he is the worlds biggest Apple fan, and he has good internet security (YES you still need it EVEN if you use a Mac!) and in this instance, the malware that tried to install itself on his computer didn’t work. This can be super dangerous to the health of your computer and the safety and security of your personal data. Always be careful about opening emails — even those that look legitimate. The dead giveaways on this one? – look at the senders email address… in this case it ends in @reflectiveground.org… in no way would that be a Telstra email address! – look at the address the view bill button wants to take you to. If you hover over it in Outlook (or your chosen email client) it will show you where the button is going… if it looks foreign … delete straight away!